A policewoman stands guard outside a police cordon at Waterloo Station in central London on Tuesday, March 5, 2019, following a report of a suspicious package at the station. Three small improvised explosive devices were found at buildings at Heathrow Airport, London City Airport and Waterloo train station in what the Metropolitan Police Counter Terrorism Command said was being treated as a "linked series." Three postal bags rigged as explosive devices were found Tuesday near three major London transportation hubs, including Heathrow and London City airports, NBC News reported. 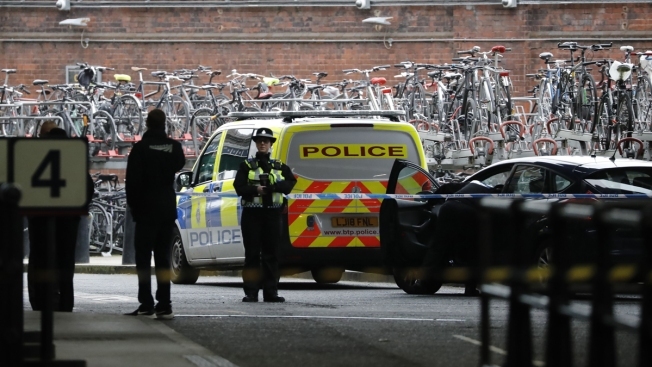 Another of the small improvised explosive devices was found at London's busiest rail station, Waterloo. They appeared "capable of igniting an initially small fire when opened" and are being treated as linked, police said. Staff at a Heathrow administrative center were the first to report one of the packages, after they opened it and the device initiated. No one was hurt — part of the bag was burned — but the building was evacuated, police said. The other packages weren't opened when they were reported, and were rendered safe by police. No arrests have been made.